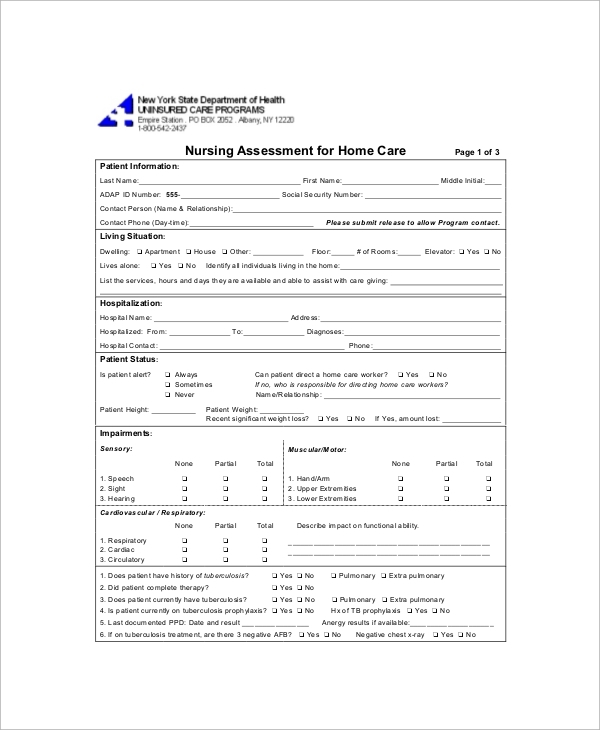 Nursing assessment forms are absolutely necessary before admission for medical purposes. They are complete Physical Assessment Forms that check the entire body through manual interview and system reviews. They assess the mental and psychological status, vital signs, organs status, and status of vital processes in the body. Questions are generally present with checkboxes and they are mandatory before undergoing medication or surgery. 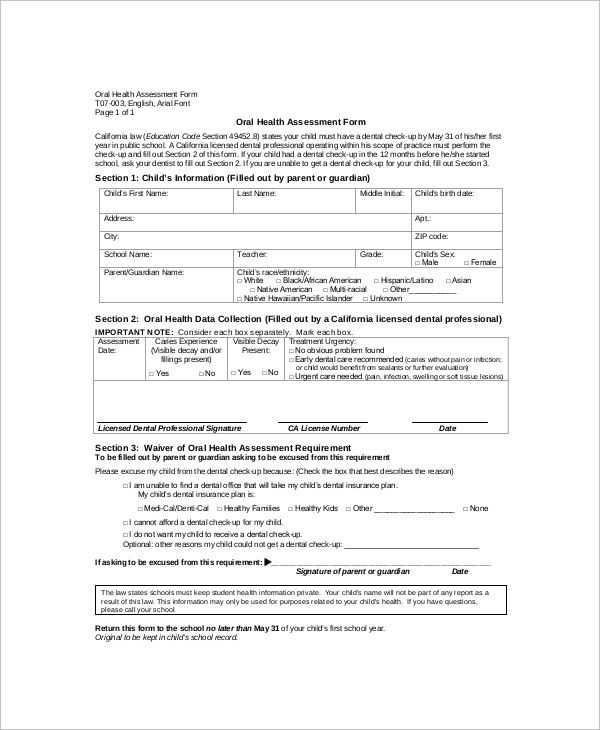 This is a complete physical assessment form for nursing purposes. It contains set of questionnaire and checklist to assess the person from all aspects and parameters.Other than current medical status, it also has provision for patient information and authorization provision in case the person is doing it for insurance companies and health policies. 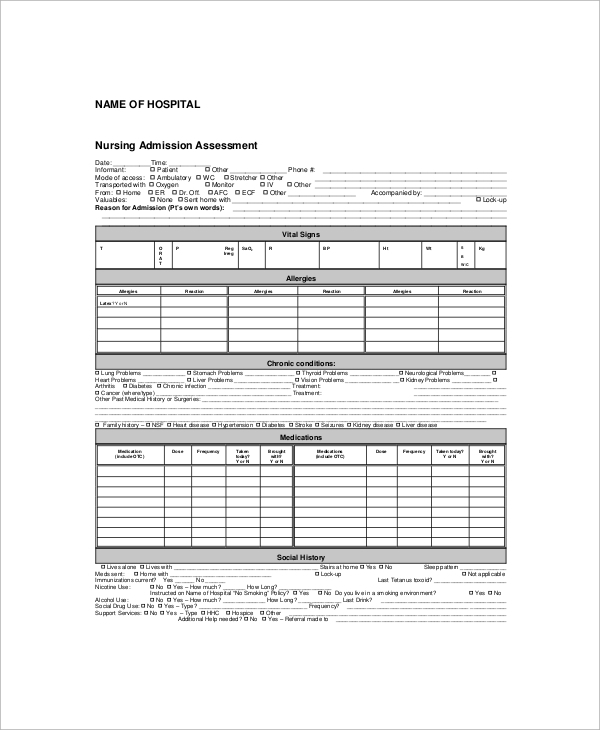 This is a complete form that has to be filled before taking an admission for medication, nursing or any other admission purpose for that matter. It has all the necessary provisions such as vital signs, allergies, chronic conditions, dietary habits, disabilities all of which can be obtained from the patient.Other than that, there are provisions for reviews that will be obtained by systems such as neurological details, cardiovascular, respiratory and every other body parts. 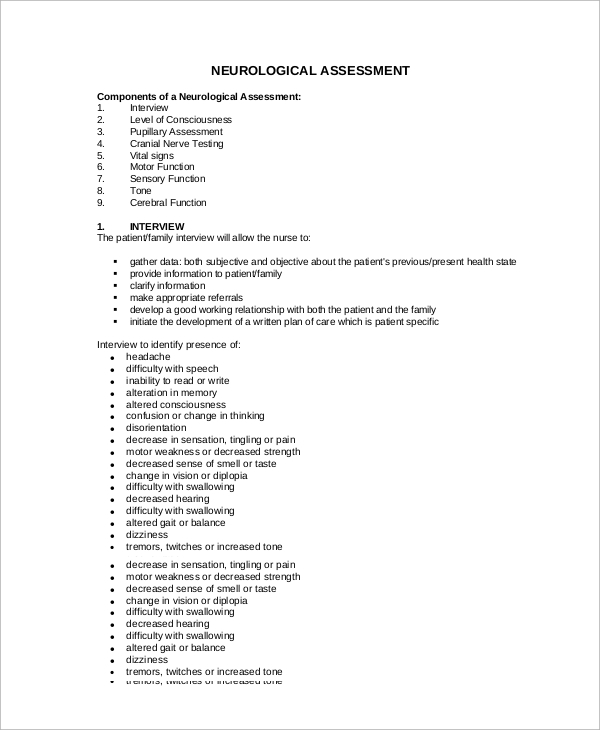 This is a complete neurological assessment form. It consists of an interview for identification of problems, vital signs, brain, motor nerves, cranial and sensory nerves functioning.It takes into account cerebral assessment, consciousness and important nervous system related parameters. It establishes the mental fitness level and is vital before going to medication or surgery related to neurological parts. This is a general nursing assessment form that checks every part of the body starting from hair to prostate. Its provisions are a general survey of the entire body noting down the vital signs, physical pain regions, and lymphatic associates.It moves on to systems such as nervous, muscular, reproductive and cardiovascular. It involves several techniques to yield the best possible efficient results. 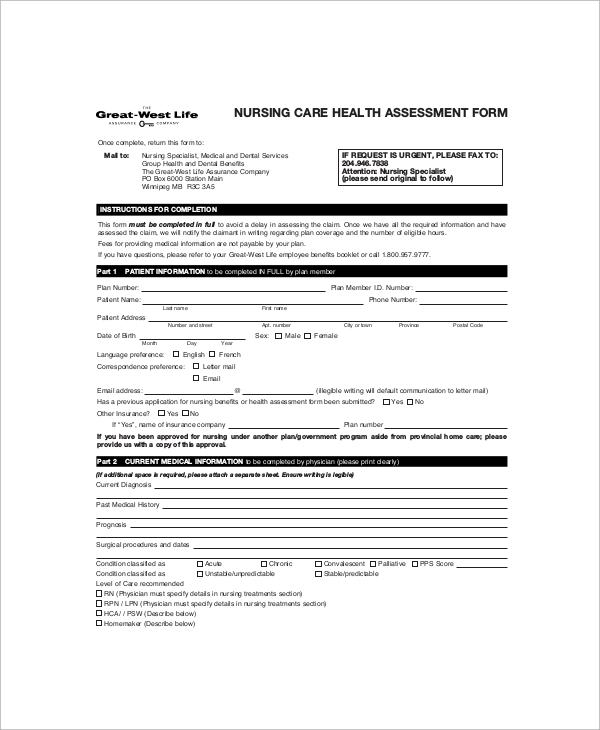 Nursing assessment forms are a prerequisite in any clinic, hospital or nursing home before a person can undergo medication or surgery. 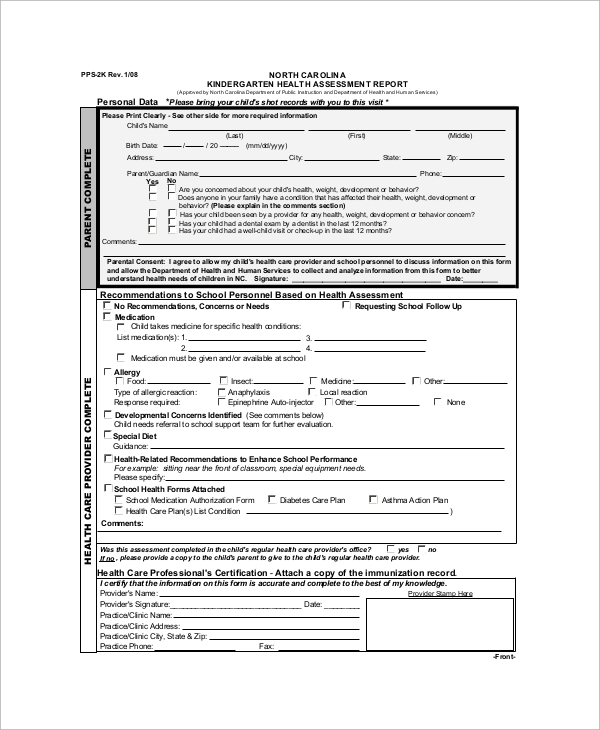 These forms contain all the necessary questions and parameters that must be assessed through interview or system reviews to understand the current status of the person’s body and body processes. It contains provisions of critical data that are necessary during emergency conditions. Such forms can also be used in future and as a reference in taking admission for education and job. You may like Self Assessment Forms. The targeted audiences in these forms are the patients who are about to take admission in hospital, therapy clinic or to undergo surgery. They contain all the parameters that must be judged and stored for future use and help the doctor in assessing a person with more efficiency. They are also helping in taking admissions in any educational institution or recruitment in any company for job whereby such forms act as a legal document to verify that the person is mentally and physically fit to take up his new endeavors. The benefits of assessment form are that a person and his relatives can know the exact weaknesses in his or her body. The Interview Assessment Forms reveal a lot about the mental state of the person and different vital body process and abnormalities. To refine such assessment, system reviews are done and results are duly noted and the exact region of pain and its causes are analyzed. This helps in efficiently curing the problem. 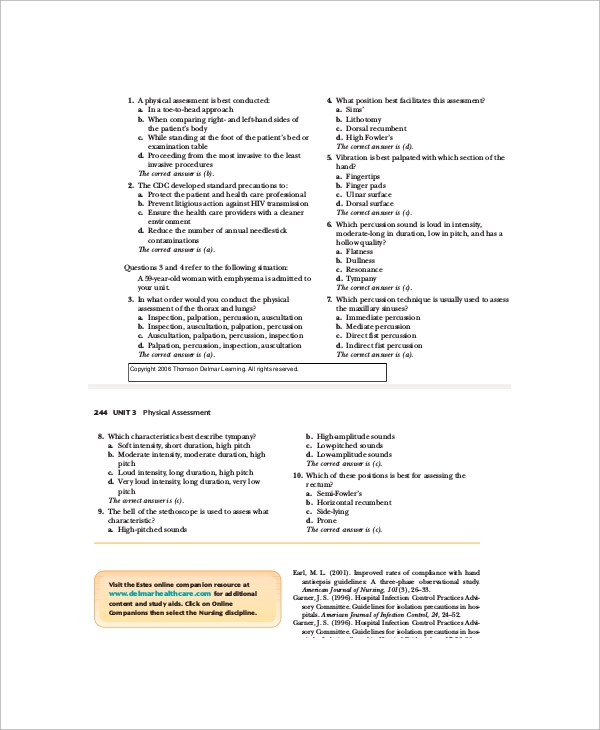 Nursing assessment form samples contain nursing assessment checklist and other vital medical and surgical nursing information. They are ready-made templates and are useful for any health organization to assess a patient, especially before undergoing a medical surgery so that during any emergency, such information can come handy. They can be full body assessment or separate body system assessments.